Croatia is the kind of place where you step off the plane and instantly know this is where you are supposed to be. The air is warm, inviting and pure. 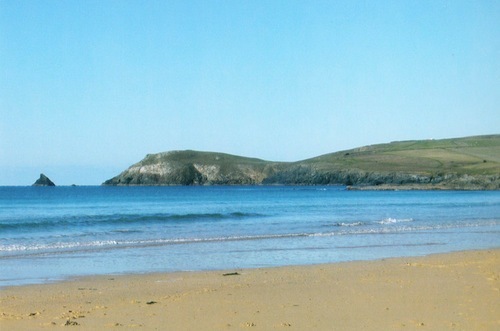 Rocky green slopes meet pristine, crystal waters. I mean, we saw a scuba diver underwater from the plane…we were as giddy and giggly as school children after landing, chomping at the bits to explore this (old) new land. I don’t mean to overwhelm you less than 100 words in, but fast forward to our first morning waking up…I rolled out of bed to see dolphins jumping in the bay, from our full-on window-wall. Then sauntered downstairs to be greeted by a full spread of cheeses, proscuitto, salamis, yogurts (of many varieties), fruit juices, fruits, cereals, boiled eggs, fresh breads, jams and coffee. This was our first trip to Croatia, and we did it right. Pure air, crystalline water, blazing sunsets, wine, seafood, cheeses, bakeries, stone buildings, old green shutters, red tile rooftops, ancient kitchens, motor yachts, magical forests, dolphins and hell, I even loved the sea urchins. 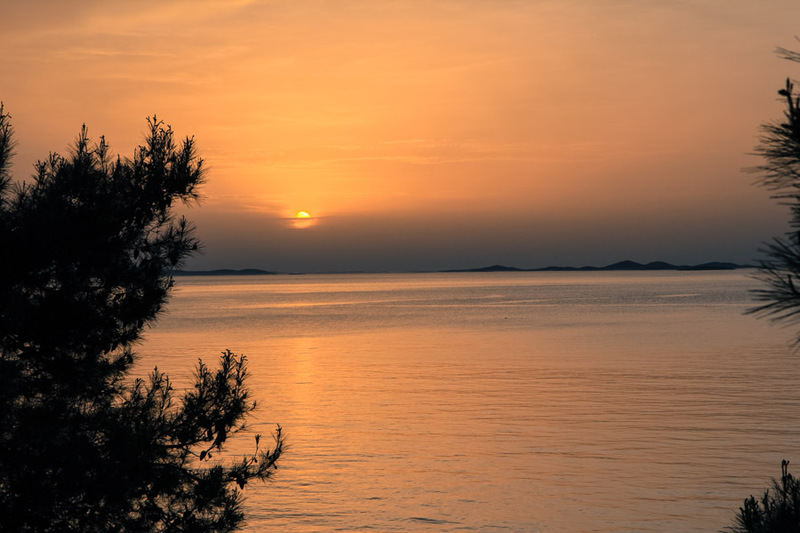 All of this enjoyed most fully because of our incredible lodging at Golden Rays Villas, in the heart-capturing town of Primošten. The villagers will all happily tell you that the golden modern glamour of Golden Rays somehow complements the ancient stone seaside town, and we couldn’t agree more. The villas of Golden Rays make the most of the stunning sapphire ocean view, with giant, clear, floor-to-ceiling windows that overlook a leafy, tree-laden little peninsula, behind which sits the main village area of Primošten and then the stoney little peninsula of Primošten’s old town. A pathway hewn into the rocky beaches leads all the way from Golden Rays to the town, in just under a mile. Well, actually, a pathway will lead all the way there, but as it’s currently being connected, you have to walk down the side of the road for about 5 minutes until you reach an entry point to the pathway currently there. We hired a car for our adventuring, but most often walked or cycled to Primošten. 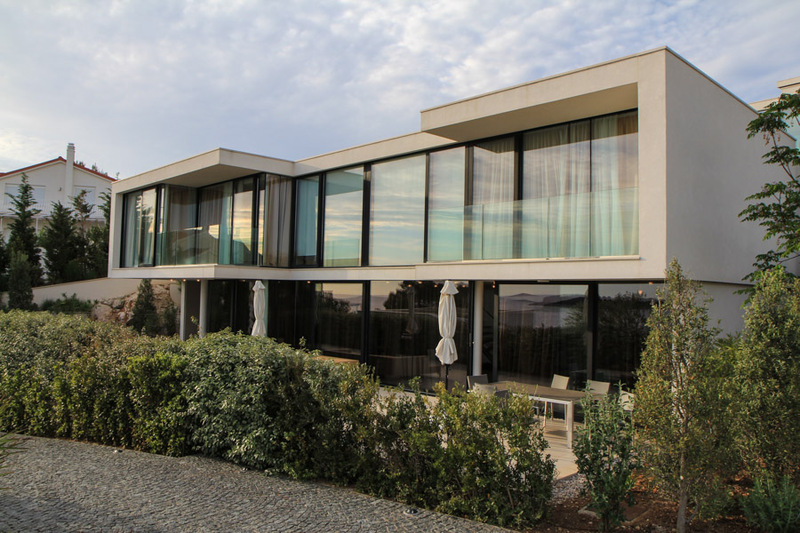 Golden Rays was built by owner Ante and his architect partner on a steep rock face at the edge of Primošten, overlooking a gorgeous blue bay, the island of Otočić Smokvica and one of Primošten’s two mini-peninsulas (the lush green one). 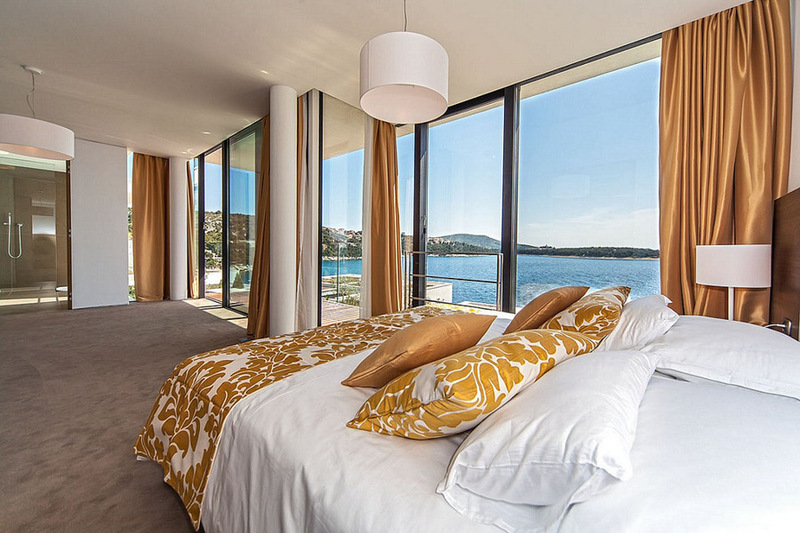 The location is not only stunning but ideal, at 45min by car from Split and situated between the quaint seaside town of Trogir to the south and lively Šibenik to the north. 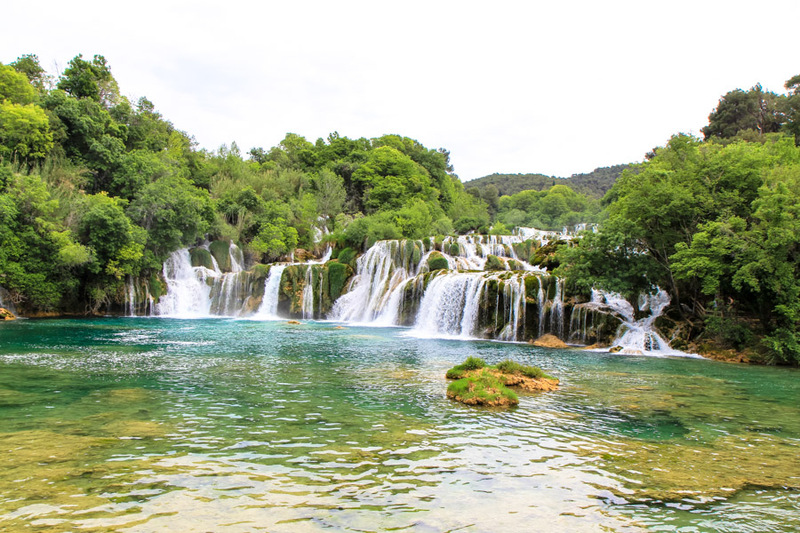 It’s also only 45 min by car from Krka National Park, one of the most breathtaking, magical places I’ve ever been. 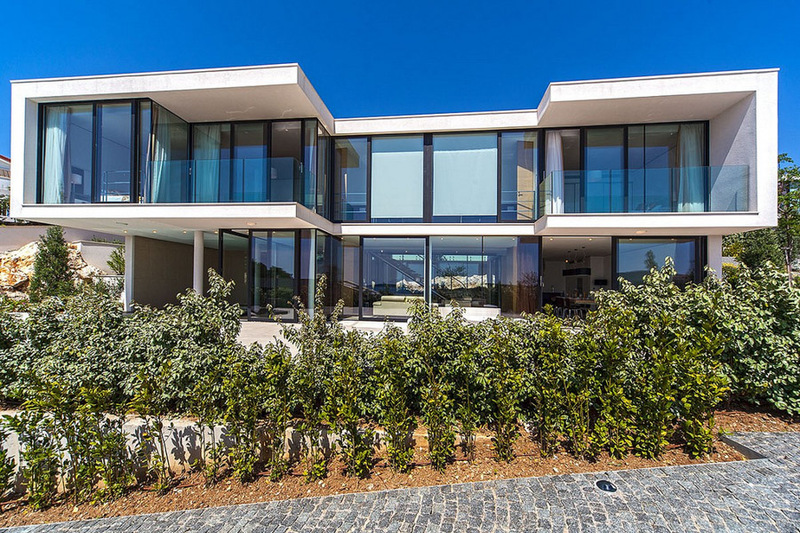 The villas themselves are completely modern, outfitted with all of the modern luxuries that maximise the beauty, relaxation and general splendour of the area, such as floor-to-ceiling windows that allow you to fully enjoy the unique vista. These windows even carry into the bathroom, so you could (and I did) shower in a lovely ‘rainfall’ shower in all your glory whilst gazing across to Otočić Smokvica. Additional features such as a sauna and shower room next to the private villa pool really enhanced the luxury experience. 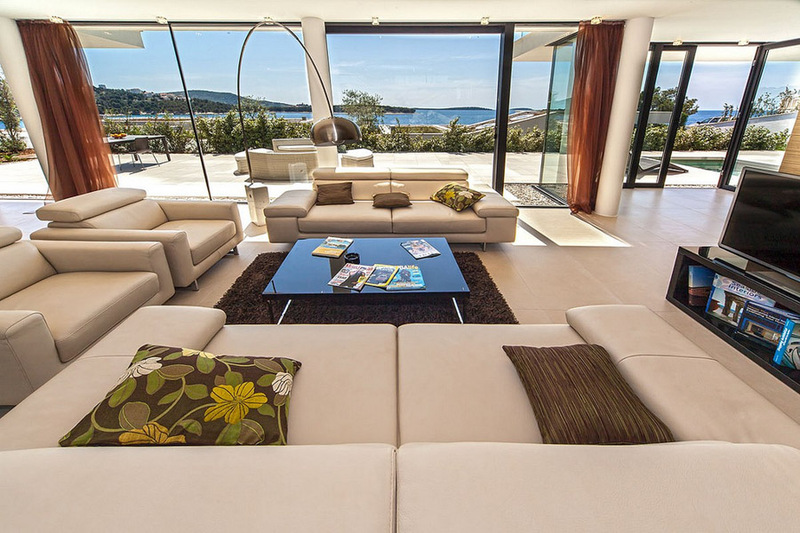 The modern elegance of Golden Rays is a uniquely complementary juxtoposition with the old-town Primošten, and indeed the whole rustic character of Croatia. 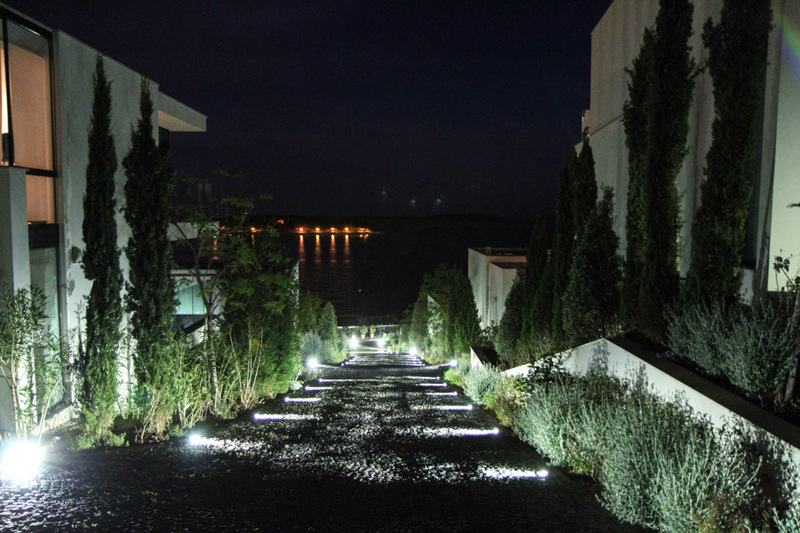 Even the locals compliment the good taste and elegant yet unimposing architecture of the modern resort, and the owners and hostess (Helena) are all well loved in Primošten. Golden Rays has 7 villas and 6 apartments, with the capacity of hosting up to 75 people. They offer several packages if you want a bit of structure or at least assistance in creating an unforgettable itinerary, some of which include the Special Week, the Honeymoon, Old Town and Krka Waterfalls Short Stay, Local Experience, In-Villa Spa and Divine Health. You needn’t book a package to benefit from some of their activities, however, as Golden Rays offers services and bookings ‘a la carte’, if you will. Ultimately, they are extremely flexible and accommodating and have your best interests in mind. It’s a great place to book out several villas or the whole complex for a company trip, which it would in fact be hosting a couple of weeks after our stay. We stayed in Villa 5, which is excellent for hosting a family or friend group, as it has a lot of space both outdoors and indoors. The back patio stretches the length of the villa and is outfitted with a dining table, plenty of seating, sun loungers and a private heated pool. To the back of the pool is the villa’s own sauna and shower room. 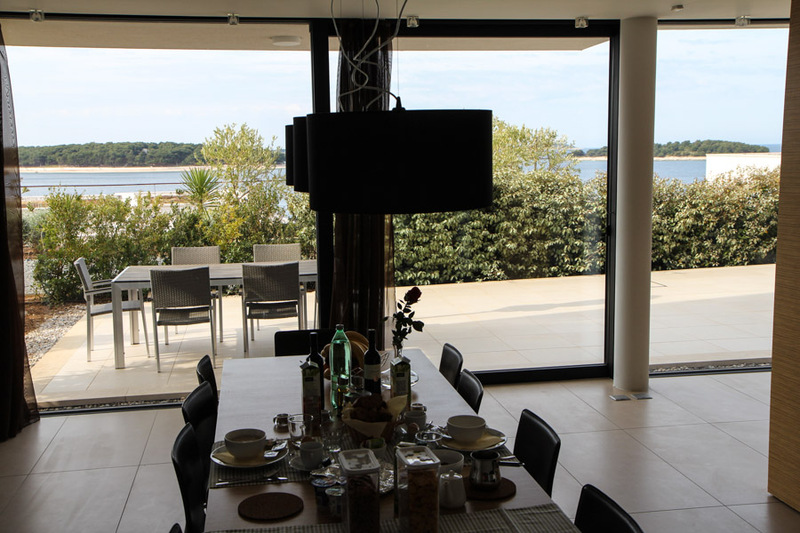 Inside, there is a spacious island kitchen, long dinning table, large, comfortable leather couches and a large bathroom downstairs. Upstairs are the three bedrooms, which can accommodate up to 8 people, including a master bedroom and a secondary bedroom, each with terraces and spacious bathrooms. The bathrooms are all windows, ocean, sunshine…oh yes, and a lovely shower. Each of the bedrooms has loads of storage space, but the master bedroom outdoes them all with a walk in closet that’s almost it’s own separate room. Croatians are quite simply some of the friendliest people I have ever met. They have a very warm, welcoming culture, with unique customs that they are pleased to share with anyone and everyone. Friendships run wide and deep, and while some locals may come across as somewhat shy, many will great you with a smile and ‘good day’. Most people that we encountered spoke enough English to get us by (and grinned good-naturedly at our attempts at Croatian). Helena and the ladies who prepared our breakfasts were extremely thoughtful and attentive to our every need, going above and beyond to create a wonderful start to every day. They even ensured our lactose and gluten free diets (about which we are ever-apologetic) were appeased. Helena is the most gracious host you could ask for, going above and beyond to ensure you enjoy your stay. She has plenty of suggestions for activities in the surrounding area and can help arrange anything for you. We are certainly grateful for all of her help towards ensuring such a fantastic and unforgettable experience. As part of a package or just as a standalone request, you can have breakfast served in your villa every morning. The staff come in to prepare everything for an arranged time and are extremely quiet, thoughtful and thorough. You can request pretty much anything you like – we opted for a more traditional Croatian breakfast, so were served the lovely spread I mentioned at the start. The portions are more than generous, so you end up with lots of fresh bread, cheese, cured meats, fruits, juices, etc. to make up a lunch to enjoy out on the patio or as a picnic whilst out and about. The staff then return a leisurely hour, hour and a half or so later to clear up your brekkers (and pack away your leftovers for you in the fridge or cupboard) so you can go about your day with a tidy kitchen. Really easy. Our hostess Helena provided us with clear directions to get to Golden Rays from Split Airport. Once you reach the gates, you just press the button for her apartment. She’ll let you in, show you to your villa, explain where everything is and review your itinerary with you if you have one (from the packages on offer). Was there a valet service? No, but there’s not really a need for one. You park your car (if you have one) in the garage space that’s part of your villa or apartment. Did the villa staff address us by name? Indeed, Helena was extremely friendly and added a personal touch to everything. As a villa complex, you don’t see much of staff, but you have the option of seeing them more if you wish through breakfast, booked in-house dinners or cookery courses, etc. Free wifi is provided and worked perfectly well. Were the recommended local restaurants and attractions good? Exceptional. 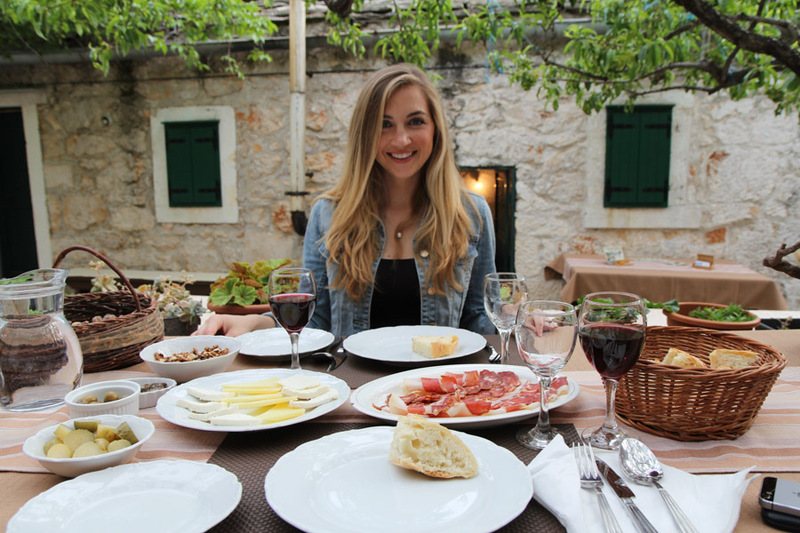 Namely, Helena’s recommendations to visit Baćulov Dvor, an old house with an ancient kitchen in the nearby town of Draga, and a restaurant called Mediteran in old town Primošten, were some of the best parts of our trip. Tea and coffee are provided when breakfast is served in the morning, should you choose this option. Was there a personal welcome note? 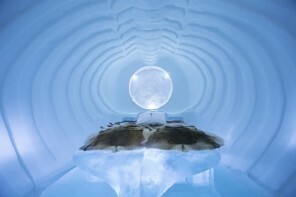 The king size bed had a medium-firm mattress, white sheets and a plush white duvet. The pillows were a bit large, but fantastically soft and cloud-like. Even the ‘decorative’ (a.k.a useless) pillows were comfortable! There was ample storage in all areas, including a large walk-in wardrobe in the master bedroom with shelves, drawers and multiple hanging areas. The kitchen has plenty of drawer, cabinet and shelf space. The toiletries provided were not remarkable, consisting only of two little shampoos and two little shower gels of no particular make. But again, these are not customarily provided in villas. The bedsheets were soft, comfortable and of good quality. There were plenty of towels in each bathroom, as well as the sauna room. Unbeatable. The Golden Rays panorama of rocky green slopes, islands and sapphire ocean induces a wonderful sense of peace, relaxation and general paradise. And don’t forget, you’ve got resident dolphins popping up for a show quite regularly. The villas are very well designed to give you complete privacy the villas are not overlooked at all. How was the sleep quality? Overall, sleep was very restful. My tender head found the pillows a bit too firm, but not enough to request different ones. 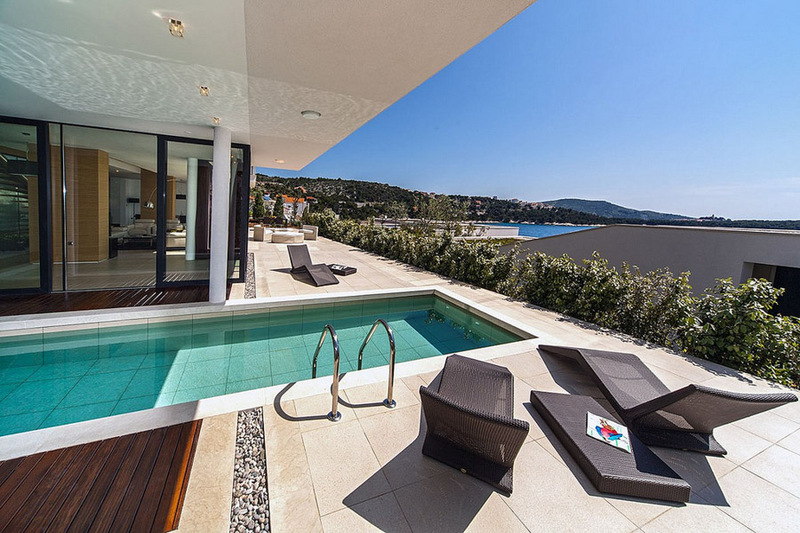 Each villa is fitted out with its own private pool, some indoor or covered and part outdoor/open. The kitchen was spacious with good quality appliances, dishes, glassware and cutlery. Our particular villa, Villa 5, had a sauna and shower room adjacent to our pool, as well as a very spacious patio with a large grill. 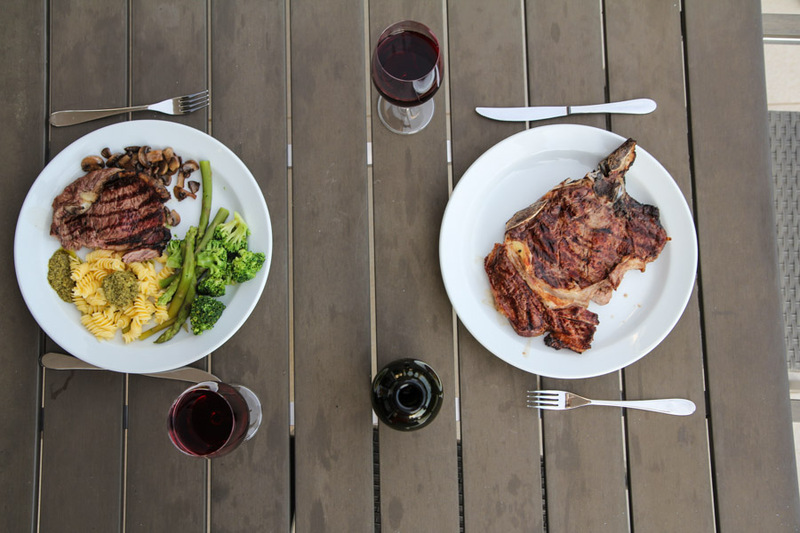 Which we happily used for these steaks. Next to the sauna room, there is a place where you can hook up music to play outside. We did learn that our villa is considered the ‘party villa’, as groups of people love to rent it out for week-long parties, of sorts. Our stay, being the two of us, was of a far more relaxed and romantic nature. Krka is magical. Magical, alluring, captivating, eye-twinkling, jaw-dropping natural beauty along the Krka river, sourced from the Dinara mountains – I’m not joking, this is where unicorns and tree nymphs were born. Glacial travertine waterfalls, moss-covered forest, rich earthen smells, jumping fish and singing frogs. The forests and waters are ancient and largely untouched, which gives you a sense of discovery and wonder as you patter along the pathways. 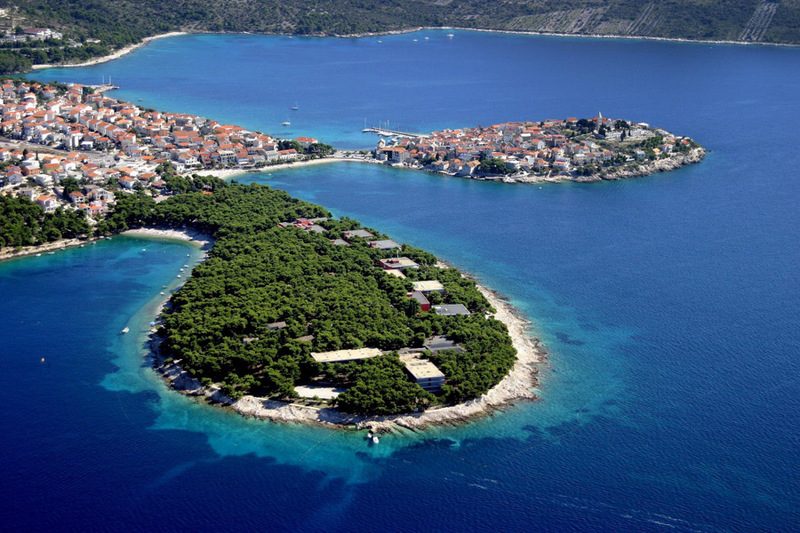 There are also two other national parks in the area, so if you are a nature lover and explorer by nature, Primošten is the ideal home base. 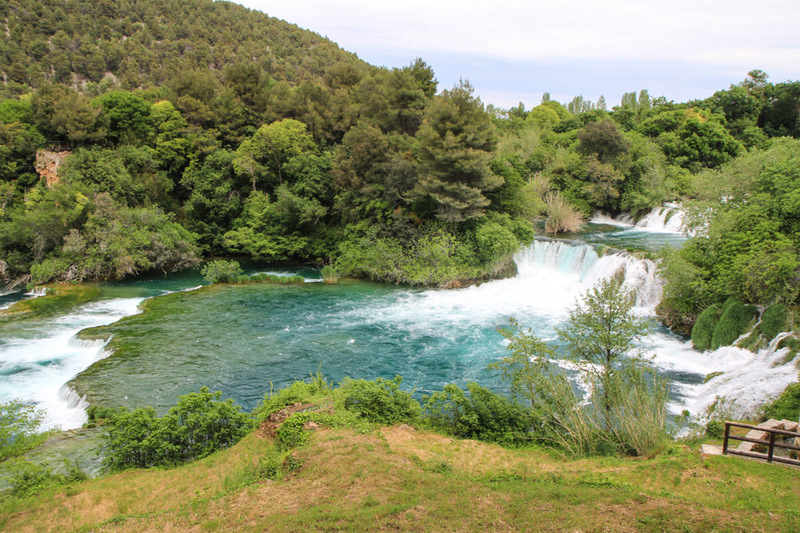 Krka is also dotted by some ancient ruins that are worth visiting, but be mindful of the park entries – some ruins you can only reach by taking the paths on foot! A captivating, lively and colourful seaside town with beautiful sights and buildings. Definitely take a trip here to stroll around through the city and grab lunch or coffee. There is also some nightlife here for those this may interest. Another seaside city, larger than Trogir and Primošten but not as large as Split. It’s a nice place to walk around in the old city and have a coffee or sit down for some lunch. From here, we took a motor yacht from Splendid Yachting yacht charters, as arranged by Golden Rays, on a trip to some of the nearby islands. Riding around in our 39-foot was nice enough, but the quaint island town of Privic Luka was a beautiful site. 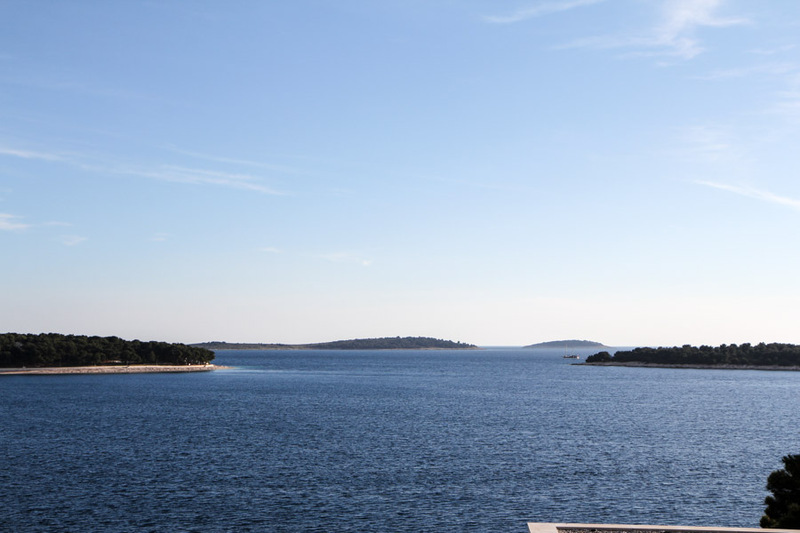 We also took the boat to a small bay called Tijat, which is where the locals of Šibenik go to lounge and enjoy the pristine waters. 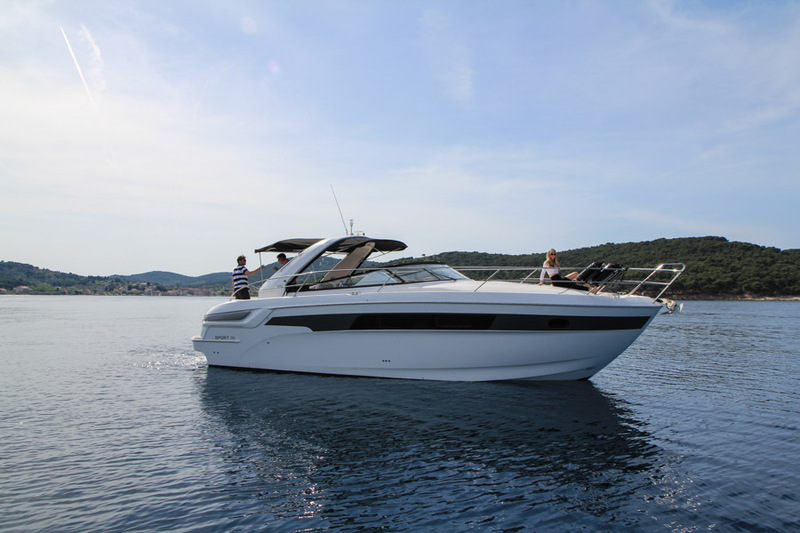 Here, you can also anchor up your yacht to spend the night and receive yacht-side breakfast service. Splendid Yachting is a new partnership for Golden Rays, and we think they’ll do splendidly. They have the same friendly, personal attitude and high standards of service. The idea is that yacht-goers can spend some days in the villas before or after setting off on a week-long charter, but in the off-season and on special request, Splendid is willing to rent out yachts for shorter periods of time, even days, half-days or hours. They also have a handy partnership with Moët et Chandon, so should you indeed book with them you’ll be greeted by a lovely ‘Welcome aboard!’ with Moët et Chandon and fresh fruits. After the island of Hvar and the city of Dubrovnik, Split is the next most well-known destination in Croatia as of yet (but we’re selling Primošten pretty hard). A trip there and you can see why – Diocletian’s palace is large, impressive, and still lived in by many of Split’s residents! 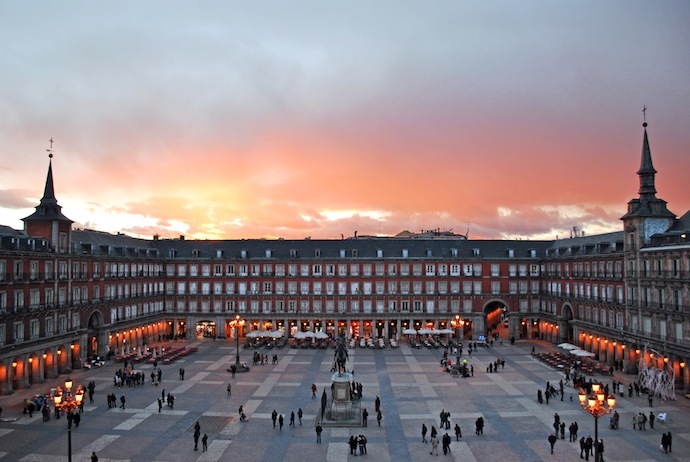 Whilst many areas have been preserved and are open to view, the palace is massive, and many people have taken up residence, opened up restaurants, shops, markets and ice cream parlors in the palace, making it their house, home and city. The streets are narrow and all stone – truly Game of Thrones-esque in the style of the Free Cities and Meereen, specifically. So similar in fact that…oh, what do you know! As it happens, Game of Thrones was being filmed there when we visited. Draga is a short drive inland and is the home of ancient Roman ruins, as well as Baćulov Dvor, an old house with a very old kitchen that has been preserved and is still in use to this day. You can eat here and try their house-made babić, as well as visit the old nooks and crannies of the house, including an old original room of the family that has been preserved, slanting stone shingles, ancient wooden bed and all, as well as old cellars, an original donkey-turned grinding mill to make olive oil (still used to this day), and an old dining and entertaining room. 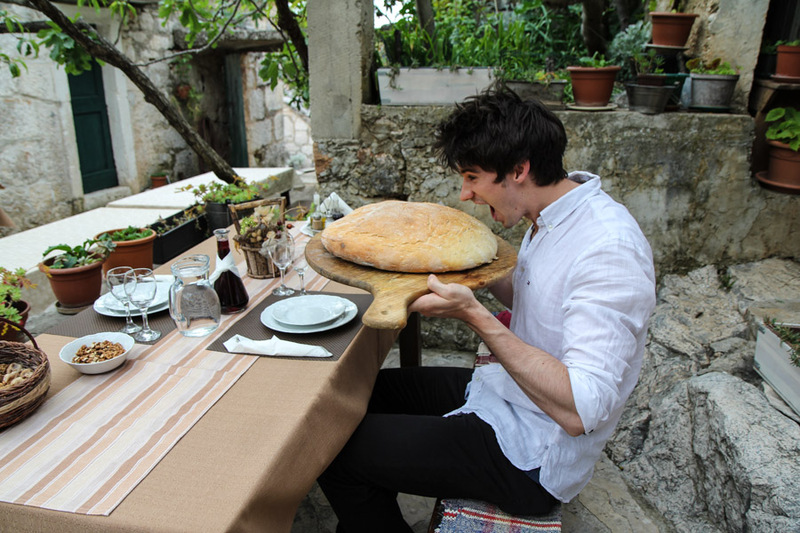 Croatian cuisine consists of lots of cheese, primarily a rich goat-milk cheese and a milder sheep-milk cheese, and cured meats, primarily salami and prosciutto. A typical spread of snacks or pre-meal hors d’oeuvres consists of these as well as dried figs, sardines (from the area), olives, pickled mini-cucumbers and gherkins, freshly baked bread and Babić wine, the most popular native red of Croatia. Our personal favourite, however, was Plavac wine, another native red of Croatia that comes from the warm south. 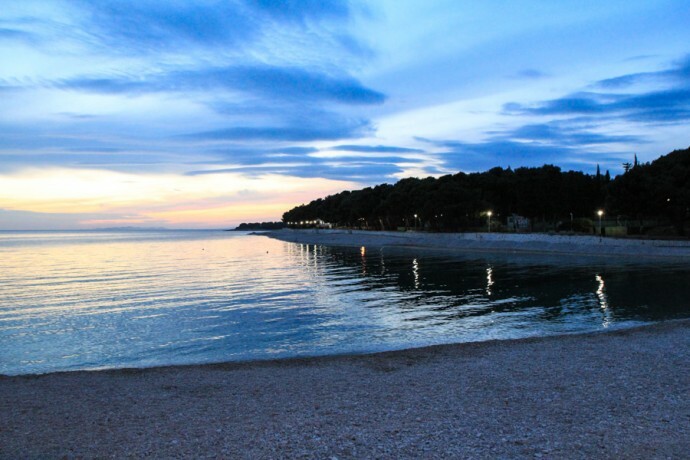 In such coastal areas as Primošten, seafood is also a main staple in the diet, in particular tuna and scallops. Our dinner at Mediteran consisted of each of these, presented in very delicious and unforgettable ways. Our starters included a large, succulent scallop wrapped in prosciutto with a tangy orange sauce, followed by a tuna steak served in a cold, light, tangy marinade with capers and unions. There were of course only a few of the delights of the restaurant, which you can read more about in our review of Mediteran. Then also, there is the meat. 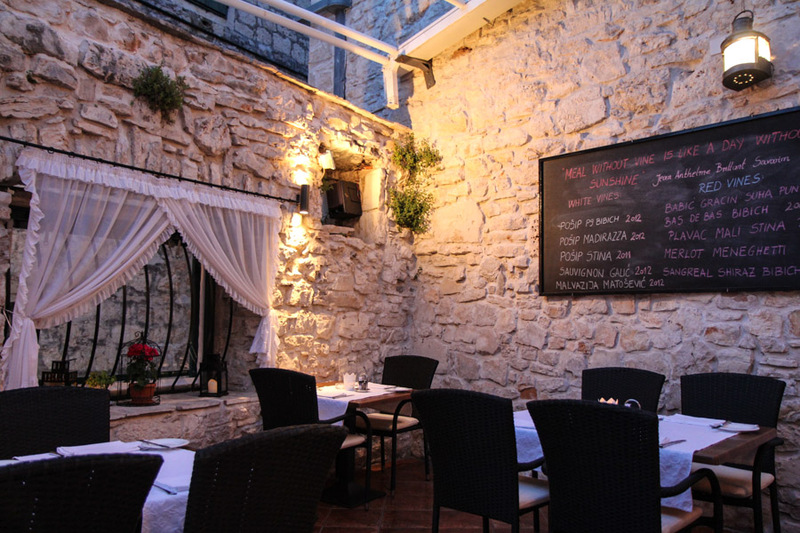 There are several butchers’ shops in Primošten, serving many cuts of local beef, pork and lamb as well as locally raised poultry and fresh caught seafood. We picked up a kilo of thick, juicy sirloin from a nearby butcher as sizzled those bad boys on our patio grill…paired with Plavac, fresh asparagus, high quality gluten-free pasta (Italy is just across the Adriatic, after all), fresh crispy salad and mushrooms and followed by homemade strawberry crumble (courtesy of yours truly) and a bottle of Laurent Perrier down on the rocks by the sea, we had an evening to remember. Some would say that Croatian cuisine is rather standard Mediterranean, but I think it has its own unique contributions and flair. Our experience at Baćulov Dvor best demonstrates this. In this old, historic house built into the rocky hills of Draga, the original family (the descendants of whom are still the owners) built a traditional Croatian kitchen that uses a large brick oven, in which you place a metal lid over marinated pots of food and then place a pile of burning wood on top. The heat surrounds the food and roasts it evenly, resulting in succulent, flavourful stews and gorgeous, giant loaves of bread. We were served a mouthwatering, hearty traditional Croatian stew with roasted pork, potatoes and onions in a savoury thin broth with said gorgeous bread, following of course the traditional Croatian spread of cured meats, cheeses, olives, pickles, figs, sardines and Baćulov Dvor’s own Babić. For dessert, we were served Turkish coffee with traditional little lemon cake balls (similar to doughnut holes) sprinkled with sugar. 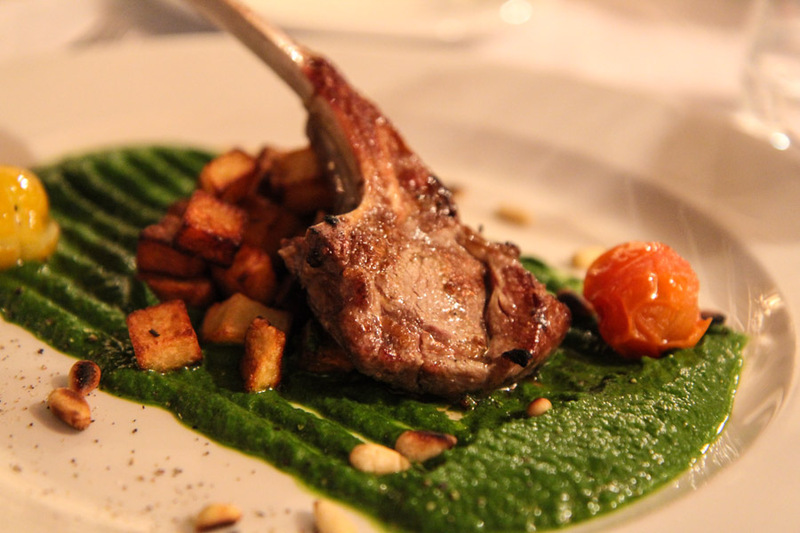 Ultimately, if you’re looking for an authentic, traditional experience with Croatian cuisine, this is the place to enjoy. It really is! Everything was just breathtaking. We heard it was very busy in the Summer so spring is the perfect time to visit it! Love Croatia! I’ll have to check this place out next time I’m there. Looks fantastic! You won’t regret it such a lovely location – still have dreams of waking up in that bed overlooking the ocean!